A big change you may have noticed on the campus of Rowan University is the addition of solar powered tables on the Student Center patio that are equipped with charging ports. This allows students to be able to eat or simply just hangout outside all while charging their electronic devices. Students seem to be enjoying this new addition. Jordan Sgro, a junior marketing major, loves being able to sit outside on a nice day with his lunch and charge his laptop. Even though these tables are a brand new edition it is already rare to find an open table to sit at. This is according to Robert Emmanuel, who is the AVP of Facilities and Operations at Rowan. Each table has four pads that can charge your phone wirelessly. They also all have USB charging. 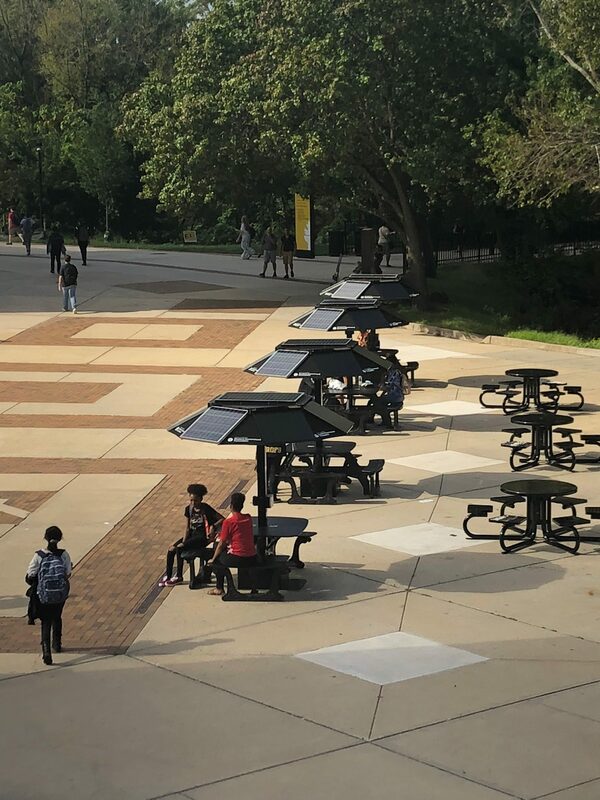 The tables are fully powered by the sun. They also work throughout all hours of the night. Each table contains a battery in it’s base that keeps it charged during the hours the sun isn’t out. These batteries can hold a charge for multiple days. A few cloudy days here and there won’t stop you from obtaining the benefits these tables provide. “The only scenario where we would see the tables not work, is if there was a week-long total eclipse,” Emmanuel said. Emmanuel, along with members of the Rowan SGA, went to a conference with other SGA’s nationwide and received great feedback on the solar powered tables. “We have definitely generated a lot of buzz with this project. We’re a pioneer when it comes to this. We’re one of the very few schools in America who have something like this. At the conference, many of the schools loved the idea,” Emmanuel said. With success comes a demand for more. The solar powered tables on the student center patio have been a big hit and there might be more to come. With numerous projects going on, and many plans being discussed for the future, students are buzzing with excitement over the future of Rowan University.